Double Chocolate Donuts. My husband and older daughter love all things chocolate. I am more of a vanilla girl. I made these chocolate donuts for them. Most of my donut recipes can double for breakfasts, but this recipe is extra indulgent and better as a dessert. These chocolate donuts are almost like a brownie in donut form. 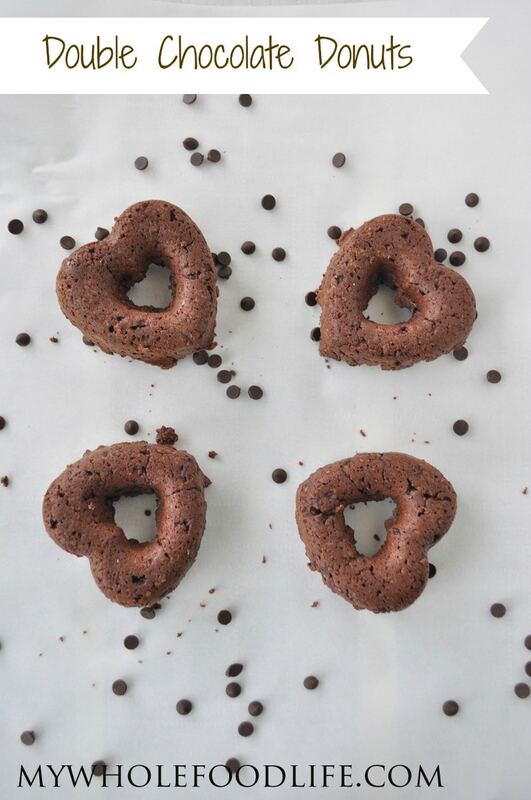 I was excited to make these chocolate donuts because I got to break out my heart shaped donut pans . I bought them right after Valentine’s Day when they were 50% off. Aren’t these chocolate donuts super cute? My kids loved them! These healthy vegan chocolate donuts are gluten free and vegan. In a small saucepan, melt the coconut oil, chocolate chips, vanilla and maple syrup and mix until everything is combined. Add it to the bowl with the dry ingredients. Lastly, add in the almond milk and the flax eggs and mix everything until it's combined. Grease your donut pans . Spoon batter into the pans. Wait until the donuts have completely cooled before removing them from the pans. Store in an airtight container in the fridge. You can also freeze them for longer storage. Wishing I had a donut pan now! Have all the ingredients. Do you think these would work as muffins? I think they could! You may need to adjust the cooking time though. Can you use your homemade chocolate in place of chocolate chips? Maybe? If you try, please report the results! Amazing!!!! I love the hearts! You create the most amazing recipes!!!!! Cute pan! And these sound delicious! I am guessing maybe 12 minutes? These look delicious. Can't wait to make them! Love the simple ingredient list, too. Made these today. Yum! Weren't quite as moist as some other donuts, but great anyway. Next time might make extra of the "chocolate sauce" and drizzle on top for a triple chocolate treat. These are adorbs! Love the heart shape! Can't wait to make them for my husband! I am so glad to meet another vanilla girl :) I am not a fan of chocolate and everyone thinks I'm crazy! Thank you! Yes that would be fine. Would I be able to replace the Maple Syrup with Rice Malt Syrup? what are your thoughts on replacing the cocoa with cacao. Would you use the same quantity? If you use cacao, you will probably need to use less. Cacao is very bitter. How many do you think this makes? There are 6 of us so I'm thinking I will need more than one batch. I've never heard of flax eggs until stumbling upon your blog (cannot wait to try some of the recipes!). I've of course googled it but am wondering if I can just use regular eggs?